Thousands march in Heilongjiang province • Oppose job cuts, oppose repression – workers need their own democratic trade union! The protests, captured in dramatic video footage that is banned inside China, have shaken the Chinese regime during the very week when its ceremonial National People’s Congress (NPC) has been meeting in Beijing. A key discussion at the NPC has been about how the regime will cut the workforce in state-owned industries, with widely cited reports of 5-6 million redundancies, equivalent to one in six state sector jobs. 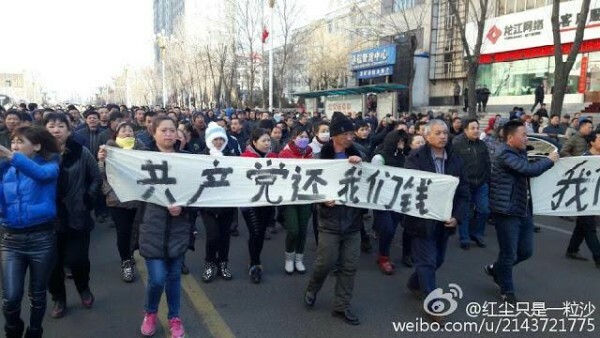 The striking mineworkers of Heilongjiang province, a region already devastated by closures and layoffs, have given a courageous and resounding answer to these plans. The mineworkers’ protests began on Wednesday 9 March in the city of Shuangyashan. 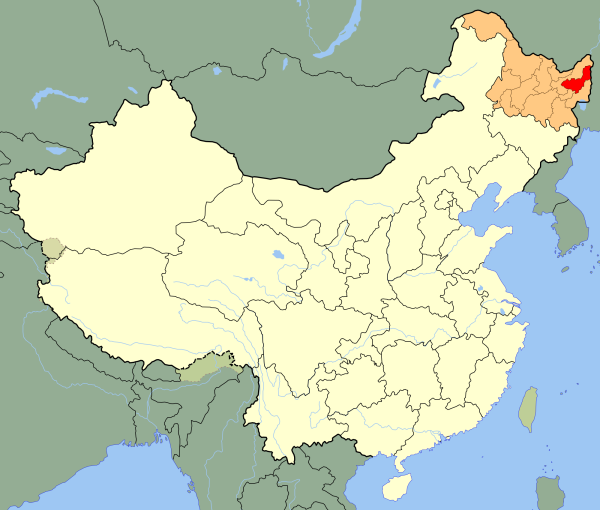 Longmay Group, the largest state-owned coal producer in northeastern China, operates 10 mines in Shuangyashan and over 40 across the province as a whole. Last September, Longmay announced 100,000 job cuts – 40 percent of its entire workforce. According to some reports 22,500 redundancies have already been implemented. The company also owes a total of 800 million yuan (US$123 million) in unpaid wages dating from 2014. 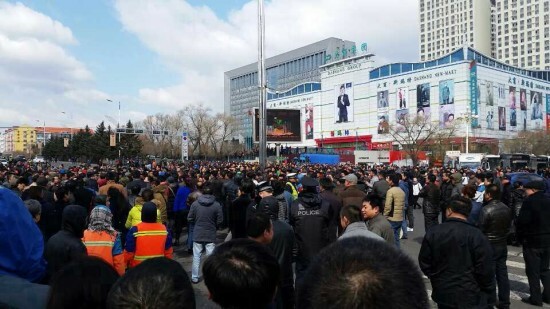 There have been earlier protests to demand payment of wage arrears by Longmay workers around Heilongjiang, including in the city of Hegang one year ago. The strike in Shuangyashan did not materialise from nowhere in other words, but is akin to a match being dropped into a large pool of gasoline. “What the Shuangyashan incident has exposed is just a tip of the iceberg. It has been pretty endemic (workers not getting paid),” a rights activist from Heilongjiang told the Voice of America website. In China, workers do not have their own trade unions. The only legal union organisation is the government-controlled ACFTU, which invariably sides with management against the workers. In the case of Longmay, the ACFTU has been invisible and played no role in supporting the workers’ protests. 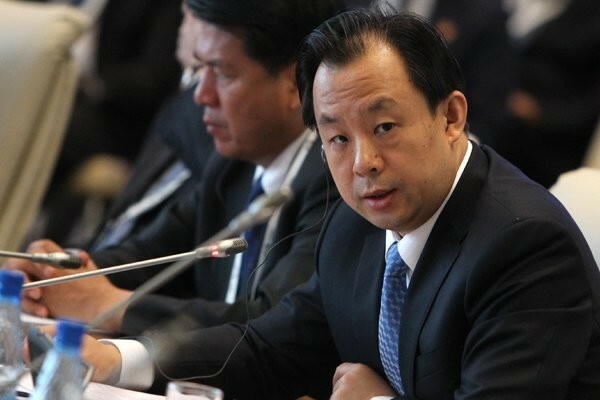 The trigger for the strike was a statement made by Heilongjiang’s governor Lu Hao during the NPC. At a televised meeting on 6 March, Lu claimed there were no wage arrears among Longmay workers and held the company up as an example of successful restructuring. He also stated that annual payrolls of Longmay are 10 billion yuan, equivalent to one-third of the provincial government’s entire budget, implying that the Longmay workforce is a burden on the province. “Their income hasn’t fallen a penny,” said Lu, in comments that made the workers’ anger spill over. Initially breaking out in the Dongrong district of the city where Longmay runs three mines, the protests quickly spread across the whole of Shuangyashan. According to local sources eight out of the ten pits in Shuangyashan are only partially working, with mineworkers facing months of wage arrears. Whereas underground workers could earn 6,000 yuan a month in the past, most receive just half this level now – when they get paid. For surface workers, monthly salaries have been cut to just 800 yuan (US$120) in some cases. The miners and their families marched to the headquarters of the Shuangyashan mining authority with banners proclaiming, “We must live, we must eat” and denouncing governor Lu as a liar. On Friday, up to 10,000 took part in demonstrations in the city. The main railway line out of the city was blocked by protesters. “Thousands of people have been protesting… the police have been taking people away,” an eyewitness told Reuters. A banner pictured on Weibo (China’s Twitter) proclaimed “Pay back the money, Chinese Communist Party!” This confirms the worst fears of the one-party regime that workers’ anger can soon be directed against the political regime and not just against local bosses for creating these problems. The workers’ decisive action forced governor Lu to issue a statement admitting his previous information was false. The governor said the provincial government would “support” Longmay in its restructuring programme, contradicting previous statements that the government could not keep “bailing out” the company, but without giving a clear commitment to rectify the non-payment problems. Lu did not mention the workers’ protests as the reason for his public retreat and China’s news media have of course refused to report on the protests. They fear that the Shuangyashan workers’ action could inspire other groups to take to the streets. Despite the censors’ efforts to hide the news about Shuangyashan, this has been among the top trending topics on social media in China. At the same time, as graphically shown in amateur videos, the provincial authorities mobilised a huge contingent of armed police to forcibly disperse the protests. The government of Shuangyashan warned in a statement on its website that it would “strike firmly” against unrest such as “blocking state railway lines, disrupting production activities, organising joint actions and picking quarrels”. This clearly shows the CCP regime’s fears that strikes and “joint actions” by workers could spread. The government is planning to close 500 million tonnes of coal capacity and up to 150 million tonnes of steel capacity in the next 2-3 years, at a cost of 1.8 million jobs in these two industries. The media is full of reports of ‘zombie’ companies and the need to deal with China’s plague of overcapacity. But the working class, whose wages are too low to afford higher consumption, cannot be held responsible for this overcapacity. Heilongjiang’s governor Lu Hao in the hot seat after workers’ protests erupt. In the coal and steel boom years of 2006-2012, a great many capitalists and corrupt officials got very rich through speculating in these sectors. But a glut was created due to unplanned and speculative expansion, with coal prices falling by more than 50 percent since 2012. Last year, 90 percent of coal mines in China were reported as loss-making. This has pushed companies like Longmay into debt. But it is the workers rather than the speculators who are being made to pay. With China’s economy also needing to upgrade to climate-friendly renewable energy and shift away from fossil fuels such as coal, there is an urgent need for more investment in green alternatives. The Chinese dictatorship, which serves the interests of the billionaires who have enriched themselves during the past three decades of capitalist restoration, wants us to believe that large scale closures and killing off the ‘zombies’ is the only way out. Xi Jinping’s attitude was spelt out at the NPC meeting on Monday 7 March, when he said Longmay must “face the market”. This was reported on the company’s website. The socialist approach is that workers’ should not pay for this crisis. Only last November, 21 miners at one of Longmay’s mines in Jixi city died in an underground fire. This is just one example of the incredible sacrifices made by coal miners in China in order to power the ‘economic miracle’ that the global capitalist economy now depends upon. China’s coal industry has the worst safety record in the world. Socialists argue that the transition to alternative energy must be planned and managed democratically, not by bureaucratic diktat, but through democratic control and management of major companies, banks and natural resources by employees themselves and working class communities. There should be guarantees that all jobs and salaries will be safeguarded. This could be accomplished by creating a vast array of new jobs in branches such as solar, wind and wave power, as well as the development of green technologies and public transportation systems, and a completely different approach to urban planning and construction based on meeting environmental and social concerns. Shuangyashan (red) is in the eastern part of Heilongjiang province. In the past year, the Chinese regime’s ‘national team’ has bailed out the stock market repeatedly. More than a trillion yuan of government funds have been poured into supporting stocks to save the financial speculators and banks from making bigger losses. But for those like the miners of Heilongjiang there is “no money” according to the CCP officials. The strike in Shuangyashan is an important sign of what is happening in China. It comes at a time when the number of workers’ protests is soaring, with 90 percent of labour conflicts linked to wage arrears or non-payment of social entitlements such as housing and pension funds. 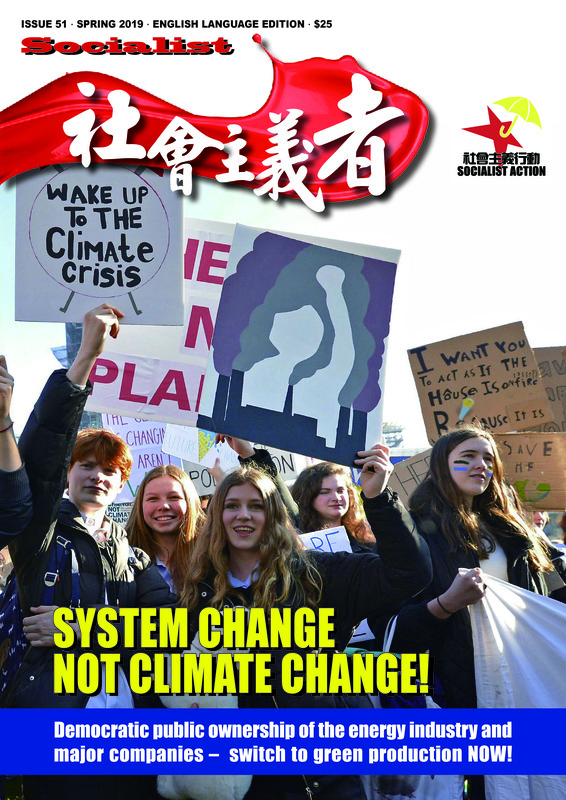 Last year, according to Hong Kong-based NGO China Labour Bulletin, there were 2,774 strikes in China, which is double the number in 2014. But CLB’s strike data is based only on social media posts and the very few strikes reported in official media – it believes the real number of strikes in China could be eight times higher. The northeast, including Heilongjiang, has been the scene of huge workers’ struggles in the not-so-distant past. In 2002, tens of thousands of workers in coal, oil and metal industries protested against redundancies, even launching for a short period an independent trade union. 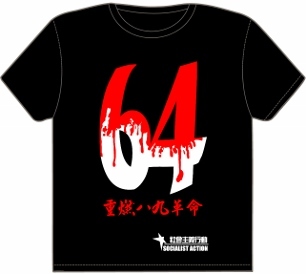 That movement was brutally crushed by the CCP, with workers’ leaders imprisoned. At that time the CCP regime under former premier Zhu Rongji presided over mass downsizing and privatisation of state-owned enterprises. Around 40 million state sector workers lost their jobs between 1997-2002, in a reform that was praised by the global capitalists and held up as a model for China’s current rulers to follow. Today, Xi Jinping and his government are preparing a new wave of downsizing and layoffs aimed at the ‘zombie’ companies. They say this will be “gradual” and insist it won’t be on the same scale as the job destruction under premier Zhu. At the NPC, the government unveiled a ‘resettlement fund’ of 100 billion yuan to compensate workers. But these funds are insignificant compared to the scale of the job cuts being announced and the devastating effects this will have on regional economies such as Heilongjiang and the northeast. This region is already a social powder keg. Unemployment and crime are rising. Some cities are experiencing a shrinking population as the younger generation move away to find jobs. The Shuangyashan strike was undoubtedly a wake-up call for China’s leaders gathered at the NPC meeting. There are voices warning that the working class, not least in the hard-hit northeast, will rise up to fight these draconian cutbacks. Because the gap between rich and poor is much wider than in the late 1990s, and the global economy no longer offers new markets and sources of growth, the mood of resistance can be even more determined than it was at that time. The idea of an independent trade union movement in China, which was briefly realised in the mass protests of 2002, will be resurrected as an unstoppable force in the period we are now entering. Workers need their own democratic trade union – link-up and spread the struggle to other cities! No job losses, no wage arrears – make the speculators and capitalists pay for the crisis! Mineworkers and their families protest in Shuangyashan, 11 March 2016.